Ok so Mara said she would not mention the swift (Common Swift or Apus Apus) in her nesting activities blog. Indeed it is not hard to understand why. The bird whistles through the air at up to 50mph emitting a non-musical screetch as it does so. It is very hard to photograph or film and most people just think it is a swallow. 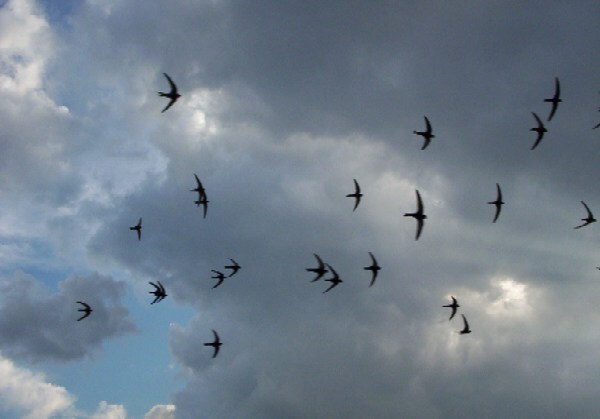 In fact the swifts are related not to swallows or martins, or any passerine birds at all. They are related to hummingbirds! Swifts and hummingbirds are the only member of a separate order of birds, the apodiformes. Unlike hummingbirds, swifts are also quite large, 12-13″ body length and over a foot wingspan. But like hummingbirds, they have tiny legs and cannot walk or hop. Hvar seems to be a very good place for swifts. One can enjoy their aerial acrobatics from late April till late September. Amazing fliers, they hardly ever land, and then only to nest. It is estimated that an average swift flies over 150,000 miles a year.